Quinte Search and Rescue, also abbreviated to the acronym QSAR, is a member in good standing with the Canadian Coast Guard Auxiliary Central and Arctic Region (CCGA C&A). The Canadian Coast Guard Auxiliary (CCGA) supports the mandate of the Canadian Coast Guard (CCG) - to provide maritime Search and Rescue coverage in many remote and local areas of Canada's coastlines, without having to maintain an active base and/or vessels in those areas. The auxiliary is dedicated to providing 24 hr search and rescue services, to enhance marine safety and rescue requirements in Canada, and prevent the loss of life, and rescue vessels in distress. By the mid 1970s, it became clear that a formal organization for training volunteer search and rescuers was necessary, in order to improve the Canadian Coast Guard's response to maritime search and rescue incidents, particularly in remote and high traffic locations. This was confirmed in a 1975 study commissioned by CCG, and led to the Canadian Marine Rescue Auxiliary (CMRA) being formed in late 1978 as a non-profit organization. This was in an effort to enhance search and rescue coverage and capability, and to better coordinate volunteer efforts nationwide. The CMRA was renamed the Canadian Coast Guard Auxiliary in 1997. The Canadian Coast Guard Auxiliary Central & Arctic Region, was incorporated in September 1978 (by the former the CMRA) under the sponsorship of the Federal Government. It's founding and rationale was to provide, correlate and support organized voluntary maritime search and rescue members and units, and the promotion of safe boating practices. The CCGA directly supports the the Canadian Coast Guard. Over the past 39 years, the CCGA has evolved into an effective non-profit organization that saves lives nationwide. The CCGA Central & Arctic Region provides the Canadian Coast Guard with over 900 volunteer members utilizing 103 vessels, and is continually expanding and adding additional assets and units. The volunteers of Central & Arctic provide over 150,000 hours of service per year to Canadians....which is completely voluntary and non-paid. The organizational structure of the Central & Arctic Region is a testament to its grassroots strengths and diversity, by providing SAR response, boating safety and prevention messages to the largest geographic area of operations within the entire CCGA organization nationwide. 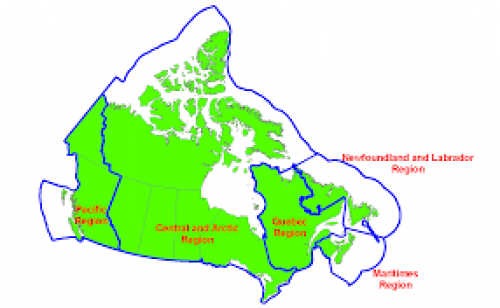 -4 provinces and 2 territories; Ontario, Saskatchewan, Manitoba, Alberta, the Northwest Territories and Nunavut. Lake Athabasca, Slave and Athabasca River from Great Slave Lake to Fort McMurray. The entire Great Lakes watershed, Lakes Ontario, Erie, Superior, Huron and Michigan. Over 175 Coast Guard Auxiliary Boating Safety Specialists in the Region. Quinte Search and Rescue is proud to be stationed in your local marina at Meyer's Pier, and provide much needed support to the CCG. We have been at the service of Quinte and surrounding area residents and boaters for nearly 40 years. We work closely with 424 Rescue Squadron based at CFB Trenton, and often participate in training missions with SAR techs, Griffen helicopters and C-130 Hercules aircraft. We are tasked for missions through the Joint Rescue Co-ordination Centre (JRCC) stationed at CFB Trenton, which is one of 3 the nation of Canada operates. JRCC Trenton is responsible for co-ordination, assessment and deployment of rescue personnel and units for any emergencies in the Central and Arctic Region. Stu Meeks, a respected and honored city councilor and first responder, felt there was a great need in the area to provide a much needed 24 hr marine rescue service. Although Stu and his family had been providing an informal service for years prior to 1978, an application was made to the Canadian Coast Guard Auxiliary for official status. You as residents of Quinte should know and be proud that we, along with a few other units, were the first ones granted status and induction into the CCGA. This tradition and pride continues to this day with Quinte Search and Rescue. 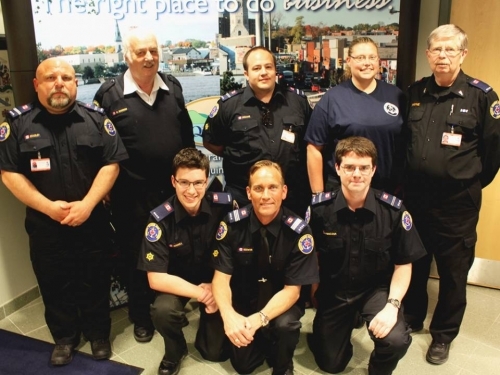 Years after LaSalle Rescue ceased operations following the passing of Stu in 2002, a few very dedicated members of the CCGA worked hard, acquired vessels at their own personal cost, and began recruiting volunteers to reactivate the rescue unit. In 2006, working with the Canadian Coast Guard Auxiliary, Howard Garrod purchased the boat used by LaSalle Rescue and launched "Quinte Rescue". 2 years later on February 6th, 2008 Quinte Search and Rescue was incorporated as a non-profit community service. Through the generosity of the City of Belleville, a private undisclosed donor, many local residents and supporters, a permanent emergency rescue dock was established at the east end of Meyers Pier Harbour. This dock was dedicated in honor of Stu Meeks, as a lasting tribute to his and his family's years of marine search and rescue services to our region. The City of Belleville set aside a portion of the top floor of the Meyers Pier building to be used as a rescue centre, office and training facility for QSAR. In 2011, QSAR was very fortunate to acquire an even better equipped and dedicated rescue vessel - the Bruce A. Sutcliffe. 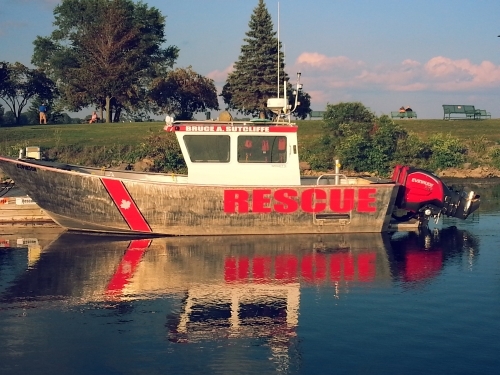 This aluminum rescue craft was built by MetalCraft Marine Incorporated of Kingston, and was purchased with the help of a generous grant from the Ontario Trillium Foundation. This was QSAR’s first purpose-built rescue vessel. This vessel is dedicated in honor of the late Lieutenant Colonel Bruce Sutcliffe, DSO of the Hastings & Prince Edward Regiment. 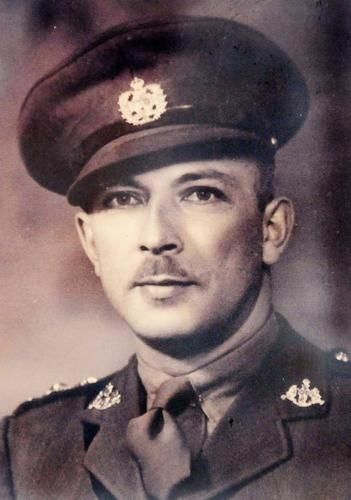 Lieutenant Colonel Sutcliffe was the WWII Commanding Officer of the Regiment when the Hasty P's landed in Sicily on July 10th 1943. He was killed by German artillery fire July 2oth 1943, as he prepared the Regiment for the assault on the hill top village of Assoro. In the summer of 2016, we were blessed with generous help and funding from a benevolent local charity (who wished to remain nameless). A substantial grant was awarded to our unit, and this enabled QSAR to purchase 2 new Evinrude E-Tec G2 200 H.O. 's - state of the art technology. Through other funding from local citizens and the City of Quinte West, we acquired a 3rd new motor for our smaller secondary rescue vessel, known as QSAR2 (Q2) in the same month. We are now in the process of upgrading and building a new purpose built 18' secondary rescue vessel this spring - a Canadian built Henley - to replace the well used and weathered Q2 we currently employ. This new dedicated rescue craft, working in tandem with our larger vessel, will provide decades of reliable and critical rescue services to the community, our boating tourists and the greater Quinte region. Quinte Search and Rescue is your dedicated marine search and rescue organization in a region that stretches from Trenton Ontario in the west, extending to Picton, and to Napanee in the East. The many thousands of hectares of water and hundreds of kilometers of shoreline, combined with heavy recreational use of the waterway, demand a dedicated marine resource that can be effective in its own right. We enhance our collective rescue capabilities for the residents of these regions, with a coordinated effort alongside other agencies such as local Fire and Police detachments. 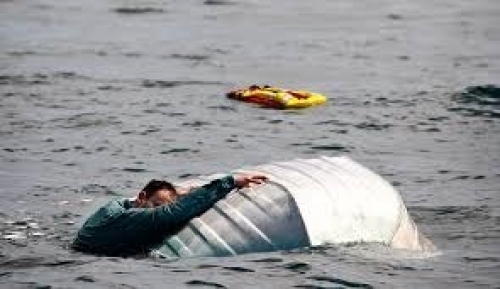 The motto of the Canadian Coast Guard Auxiliary is: "Volunteers saving lives on the water". 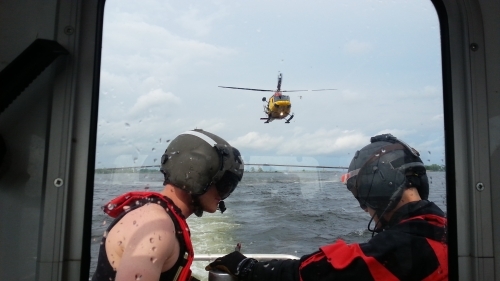 We provide 24-hour volunteer search and rescue services to cover the marine requirements in the Quinte Region and prevent injury and loss of life on the water. 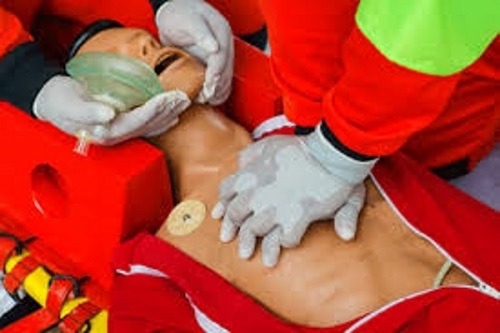 All our volunteers are trained in accordance with strict national standards set out by the CCG and CCGA. We pursue on-going training year round including: search and rescue techniques, First Aid/CPR/AED & Oxygen administration, towing and recovery, night/day navigation and safe water & boating education to enhance our skill set and proficiency in rescue. Crew members spend many hours of their own time training to become skilled and highly effective rescue volunteers. We carry proper insurance coverage for all authorized and community activities. Our members stay informed and engaged, through national and regional communication and training programs provided through the Canadian Coast Guard Auxiliary. When we assess or deem that more extensive, intensive and enhanced training is required, we work together and receive support through the CCGA. This ensures that the training mandate set by the CCG and CCGA is upheld and enabled, our volunteers are kept safe, skilled and ready to respond to an emergency, and facilitate the critical rescue services QSAR provides to the Quinte Region. The training we are provided, and that our certified instructors teach our members, is modeled on the national standards of the Canadian Coast Guard. Even though we are volunteers - your neighbors, your friends and fellow Quinte residents...we take our responsibilities very seriously. We at Quinte Search and Rescue care about you, your family and everyone's safety who live and visit this incredible region we are privileged to call our home. We are YOUR local volunteer marine rescue service, and stand guard 24/7 ready to respond to the call. Please come down and visit us at the rescue dock...engage in a friendly conversation with our members...or volunteer to become a member of this essential, respected and worthwhile rescue organization. We at QSAR are proud to be in the service of our community.